Sandwich cookies are something I almost never make. The idea of rolling out dough, then cutting, baking, freezing, etc. just seems like far too much work to me. The great thing about making sandwich cookies is that they can be done in stages-make the dough, bake, freeze, then fill a few days later. These cookies are a bit of work with all that cutting and rolling, but totally worth it. Make sure you let them set and become cold so that the filling sets up or you'll have the unfortunate experience of biting into one and having the filling squirt out the sides! 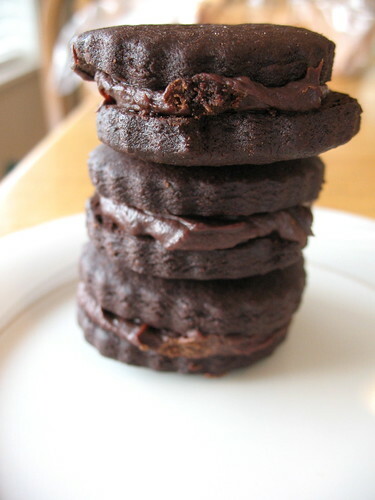 Once filled and chilled to set, they are a rich, intensely chocolate cookie with a fudgy ganache center that can't be beat. I usually can resist cookies, but these ones called to me often. I'm sure you won't be able to resist their call either! In a bowl with an electric mixer, beat the butter and sugars together until they form a grainy paste. Scrape down the sides of the bowl and add the egg and vanilla, then continue to beat until well mixed. Whisk the flour, cocoa, baking powder, baking soda, and salt together in a medium sized bowl, then stir into the butter mixture until well combined. Turn out the dough onto the counter, gather it all into a ball, then half it and shape each piece into a disk shape. Wrap them in plastic film and put in the fridge to chill for about an hour until firm. Roll your chilled dough out to ¼ inch thickness between two sheets of waxed paper. It's important to get the cookies thin so that the ratio of filling to cookie is just right-too much cookie and it overwhelms the filling. Cut out the dough with a 1 ¼ inch round cookie cutter. Don’t remove the cookies, but rather put the dough in the freezer for about 15 minutes until firm. Pre-heat the oven to 325 F.
Remove the cookies from the freezer, take them out of the dough scraps, place them on a parchment paper lined cookie sheet, and bake for 10-12 minutes until firm. Let the baked cookies cool completely on a cookie rack. Re-roll the scraps and continue cutting out cookies, putting the dough in the freezer, then baking. When the cookies are all baked and cooled, make the filling. In a small saucepan over low heat (or you could do this in a heat proof bowl over hot, not boiling, water) melt the chocolates and butter until smooth. Take off the heat and stir in the cream, then set aside to cool until it’s spreadable. Slather the bottom of one cookie with about 1 tsp of filling, then sandwich with another cookie. I found that the filling was a bit soft at first, but once they sit awhile (and especially if you put the cookies in the fridge), they harden up and are absolutely divine.